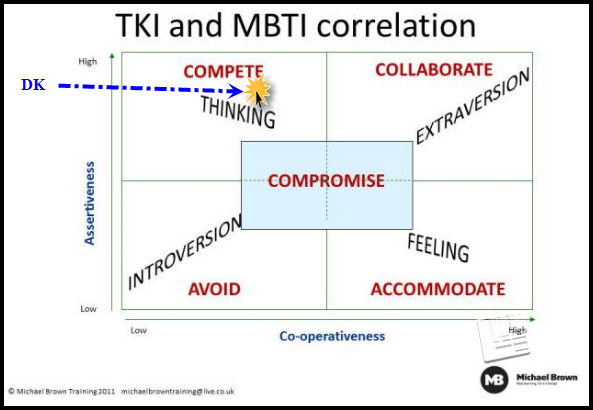 TKI & MBTI 4-box Grid: Thank you Michael Brown @ Strategic Learning For A Change! Harvard Business Review Blog Network: Compromising When Compromise Is Hard. On your own make no compromises, with others compromise is needed. Fabulous..I’ve taken a test like this before – where I end up ins irrelevant. It is interesting thought to look at the debates with this kind of filter. And I hate to say that I really believe that there are some strident voices in government that are not interested in posing thoughtful questions to better understand another’s position. They are pushing their agenda. Full stop. Yes, and I’m with you on the full stop part. Oops…guess this wasn’t one of my better comments. I’m sorry – on my way to the coffeemaker. No worries. You get 1 mulligan. BTW – Thomas Kilman Indicator (TKI) & Myers Briggs Type Indicator (MBTI). I find it curious that as a society we promote and embrace teamwork in major areas of our lives (e.g. workplace, sports), yet find compromise to be difficult, if not a sign of weakness. Yet, great teamwork, and the success it often achieves, is typically a model of compromise! I don’t think the issue is purely the domain of our politicians, as I witness this level of intractability among friends, family and co-workers … do we nourish the politicians via our actions/support, or they us? … who is the ventriloquist and who is the mouthpiece? Is compromise so difficult because we seek power, or feel we have little control over other aspects of our lives … we can at least control what we think and feel? “Who is the ventriloquist and who is the mouthpiece.” Deep, insightful – comment of the day. Thanks for sharing Stephen. Many thanks for featuring my article, David. I’m glad it got you thinking! My only comment about Compromise is that whilst it is certainly better than No Deal, it can be an unsatisfactory outcome, leaving a slightly bad taste in the mouth. “Could have done better.” I try and encourage people to Collaborate by using creativity and taking a bit more risk (normally by being the first person to open up and reveal more information). I suspect you’re surrounded my Competers at work, and how others behave and expect you to behave can change your Conflict profile. I wonder whether you were so competitive in your early years at work? Thanks for the link to Michael Brown’s article. Interesting stuff.